This black and white photograph shows the classic elegance of a New York Checker Wedding portrait. An old-school Checker cab is perfect for couples who wish to add some retro New York flavor and is a unique alternative to a limo or a party bus. A few high caliber companies offer these classic New York City staples for rental for a variety of occasions, especially for NYC weddings. Production ceased on the Classic Checker back in 1982, but the cab continues to be an enduring symbol of New York City. I chose to make this New York Checker Wedding image black and white because it gives the photo a timeless feel and makes it look like a scene from an old classic movie. City lights twinkle in the reflection of the Checker Cab’s window, giving the scene a romantic feel. Inside the cab, the bride’s face is alit with pure adoration and joy and her husband whispers into her ear. The couple has opted for a winter wedding so the bride is wrapped in a white, faux fur that covers her lovely bridal gown. A jeweled headband pulls her dark hair away from her face, highlighting the radiance of her smile. The groom is charming in a black tuxedo and bow tie, giving him a classic look that matches his wife-to-be. 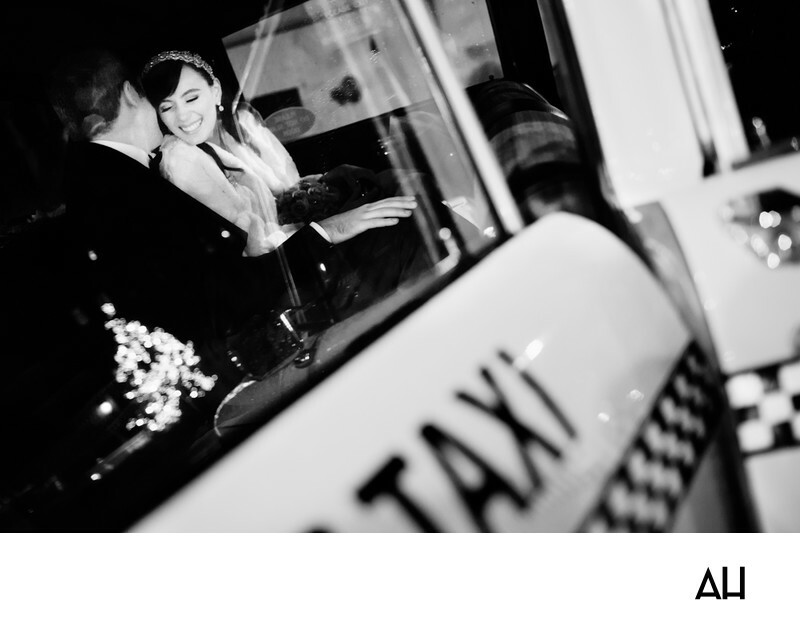 The couple is framed by the window of the open cab door, with the word “taxi” standing out in dark bold letters. The photograph is a perfect depiction of the love these two share and of the journey that has taken them to this, their wedding day.